RHYS BOWEN: It's that time of year again when I want to start shopping for Christmas presents. I have time right now and it would be nice not to feeling any pressure. But trying to pin my dear ones down to what they want is impossible. Or else it's so specific that they have to choose it themselves... "I need a pair of waterproof boots, but not too clunky etc etc." The grandkids are so easy. All they want is a gift card to their favorite store: Urban Outfitters, Sephora, Nordstroms (for my grandson who is obsessed with nice shoes). And these are easy to wrap too. My husband John is the worst. He always says he wants and needs nothing. But obviously he can't sit there and watch everyone else unwrap gifts, can he? So we all try to find something that might excite him. Every year he says "Don't buy me clothes." One daughter ignores this, buys him shirts and sweaters, and he always wears them! I have reached the point in my life when I don't need anything, but I do like small surprises. One year I told John to surprise me AND he bought me Winston Churchill's autobiography. Useful and informative, yes, but not the same thrill as a diamond bracelet. I. 've found if I want something I have to be quite direct with him. "Go into Macy's second floor, turn left, third rack, blue dress, size 10." But that sort of takes away the thrill, doesn't it? I think we've moved on to giving experiences. For our anniversary I bought us tickets to an evening of Malaysian cuisine with TV chef Martin Yan. That was fun. And we have Hamilton tix for next year. Are your menfolk good at selecting gifts?. I've just seen this year's Neiman Marcus catalog. The most expensive item is a solar powered 70 foot yacht, complete with helicopter pad, naturally. Yes, I wouldn't mind one of those but they are so darned awkward to gift wrap. And if you can afford that many millions for the yacht, would you worry about affording the fuel for it? Or for $315,000 there is a secret agent experience including learning to jump out of a helicopter. Since I've been known to twist my ankle when walking down the sidewalk I think perhaps not. The gift that did sound fun was a tennis experience, all four majors as a guest of Sloane Stevens , staying at player only hotels, lots of chance to interact with players... for a mere $550,000. At least these selections seem better than the dreadful sofa in the shape of a hippopotamus last year! I think we'll be settling for slippers and hand cream, unless you have good suggestions for an old cranky husband? Grandchildren are definitely the best to buy for . . . the babies get books and toys and clothes; the big ones get books and gift cards and whatever goes along with their interests of the moment. Their parents are so much more difficult. We really don’t need much of anything; John never has any idea about what he wants so that leaves me hunting for something unique that I hope he will like. 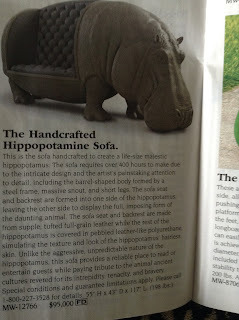 However, I believe we will pass on the hippopotamus sofa . . . .
My husband rarely buys me gifts, and when he does most of my friends are mystified by them. The first year we were married he bought me a floor length down robe--so he could keep the thermostat low. The next year he gave me a fishing pole and a pair of hip waders, prompting one friend to remark, "Karen, you get such...frilly gifts". I've all but stopped buying him anything, and discourage the rest of the family, as well, because he almost never uses anything he's given. It's really annoying, and a complete waste of money. I count success if I find a shirt that he actually wears. John probably gave you a book because that's what he would enjoy. He might very well be related to Steve, Rhys. Count my husband in the exasperating department of gift buying, both for him and from him. We pretty much just get what we want for ourselves, but I always end up buying some things for him to open, because as much as he says he doesn't want anything, I know he likes to open something up. So, a book or two and some pajamas or the sort. I get myself a bag of books. I have a large Christmas gift bag and fill it with at least five or six books. But, I do sometimes wish that he could surprise me with something that really says he gets me, or that he would be really excited by something I get him. Like you Rhys, if I do want him to get me something, I need to give instructions down to the isle and shelf it would be on or the ordering page online. I do have the granddaughters to buy gifts for that they get excited about, and that's loads of fun. My daughter told me today that the nine-year-old wanted the $99 Lego Harry Potter Hogwarts set, but that if I didn't want to spend that much on it, not to worry about it. Well, of course I want to get her that for Christmas. Heck, I want it myself. And, believe it or not, there is a $500 Lego Hogwarts set, but that one is a bridge too far. Now we need to figure out a dollar matching gift for the teenager. Oh, lucky grand girl, Kathy! Teenagers are the hardest. Now that my grandson is almost 14 I suddenly realized we can't buy him Lego sets any more. I saw the ad for that Harry Potter set. I want it too! And the Hogwarts express! I can't wait to play with the Harry Potter Hogwarts set. Hahaha! And, Karen, teenagers are so hard to buy for. My husband, too, was impossible to buy for. One year I told him to just buy his own birthday gift, so he did--a new sports car. Never did that again. On the other hand, one year he was out of town on business over my birthday, but said he'd bring me something. He did as promised, and when a friend asked what my gift was, I said, "A new bag." That was the truth, as far as it went. It was for the vacuum cleaner. A sports car!!! And a.....oh no! Hallie, she cooks the evidence, and serves it to the investigating officers! He takes the cake! In our early marriage John bought me an ironing board cover. He learned that lesson rather dramatically! @ Hank That's a Roald Dahl story. Alfred Hitchock used it in one tv episode. Oh, it gets better. When I registered a certain amount of disappointment at his choice of a gift, he said, "Whaaat? You know they're hard to find." He just had rather eclectic tastes when it came to gifts. Another year he gave me a ping-pong table (which he wanted), and another time a piano. So, not all bad...but one of you can still make him a victim. I'll be avidly reading ALL your books. Warren was the kind of guy who would actually pay attention to me all year round, taking notes on things that I said I thought were interesting, so he could surprise me with them at Christmas. He once spent a year searching for a particular watch for me because I said in passing that I thought clocks that told the moon phase were cool. I am much the same, and we both loved giving gifts, so Christmas, birthdays, anniversaries, and odd days throughout the year were always fun for us. I miss that. Now I make sure to buy myself excellent gifts for birthday and Christmas, and save them for the day itself, because who wants to pass those days without presents? Warren's father, on the other hand, was very difficult to buy for. He loved music, but his tastes had hardened to very particular versions of his favorite big band recordings, so a new take on an old favorite would just annoy him. He liked to read, but only if it was super-inflammatory political conspiracy nonsense. He didn't do computers. He no longer got out to play golf . . . Finally we realized that he still liked to eat, so we began buying him baskets of gourmet mustards, interesting cheese, and exotic salami. That went over well. Sometimes you just have to get creative. I think those monkey socks are weird. Really really weird. Yes! Very, very weird. So weird they give me the shivers. Scary as bad clowns. Burrrrrr! Hugh and I have been giving each other dinner and a concert for a few years, but when he asks, I always make sure to point out how much I love new silver earrings... This year I have to get going early on stuff for my sons and others, because I'm having what I hope will be minor knee surgery on December 20, so last-minute shopping isn't going to be possible. I do have a one-year old great goddaughter to buy books for, though, and a fun outfit. THAT will be easy. I don't have to worry about much in the way of Xmas shopping anymore. The extended family gathering on Xmas Eve was ended 2 years ago so that's out. With my mom's death 2 years ago, we pretty much stopped exchanging gifts in the immediate family as well. I have a 2 year old nephew that loves cars so I'll buy him some of those. And there are a couple of young cousins that my mother bought books each year and I've continued that "tradition". I used to buy for the people I work for, but I don't believe I'll be doing that this year. And I know that when I had to buy something for someone, I did not like to be told "Surprise Me!". I'm more of a "Make out a list of options for me to choose from" kind of shopper. As for me, I'm easy to shop for. Anyone that asks what I want for Xmas is told "Barnes and Noble gift card." And since you can get those at most grocery stores these days, people don't even have to go out of their way to pick it up. However, to be honest, Xmas really isn't that big of a deal for me anymore. So I'll likely just be at home watching some incredibly badly written Hallmark movies on Xmas Day and not really worrying about doing much of anything at all. Oh, and I usually get a small Xmas bonus from my job. I usually put it towards a bill but this year I'm thinking I'll buy tickets to a couple of the already 8 concerts I want to see next year and get the costs out of the way for them. OH Jay, this sounds so sad and I can tell you really miss your mom! Rhys, no worries. I don't think of it as sad. I just don't have a lot of desire for holiday cheer these days. I'm all in for Turkey Day because of the big meal and football, but Xmas is really more of a thing for youngsters and their parents. I'm not a youngster and thankfully I'm not a parent. As for missing my mom, this past Monday would've been her birthday and Thursday was the 2 year mark of her passing. For some reason, this year was harder than last year. It's gotten even easier these years to get what you want... just send him a link. My husband is happy to be directed (only when it comes to what gifts to give me) but he's also luxury-averse. Occasionally he's surprised me. Though truly I do not need (or want) a diamond bracelet. Lucy, I can NOT imagine buying $100 stuffed toys for toddlers. Tho in shopping Amazon's toys, one of this year's best sellers is a 4' tall stuffed giraffe at $80. It had more than 1500 customer reviews and was rated 4 stars. I bought our little Jody (shhh) a fire truck which he'll love and now I'm in the market for a tumbling mat for Franny. And my husband is imPOSSible to buy for. I always make him a big box of dark chocolate covered orange rind. And can I just say, the best gift is the pleasure of giving my kids what I know they want and can't afford themselves. Goodness, I haven't even bought the Thanksgiving turkey yet! I've solved the grandchild Christmas gifts years ago. They each get money, including my daughter-in-laws two grandchildren. There was only one of those until last week, a fifteen year old, Jade. Now there are two, a brand new little sister for Jade. My D-I-L assured me her daughter had had her tubes tied during the C Section, so this doesn't happen every 15 years or so. Anyway, grandchildren get cash. Not gift cards because those either get lost, or what they want costs $1.95 more or five bucks gets left on the card and never spent. The grown children get their Christmas dinner. For years I've been ordered from Robertson's Hams in Oklahoma, best hams every. They are pricey but probably less than I would spend on buying something that would not fit and go back to the store on Boxing Day. This year my eldest granddaughter, Sarah, is getting married on the 28th, In Raleigh, at her brother's house. The wedding was scheduled for next May, in Managua, but with the current unrest, that is out. So they are having something small, just our family, and then a big catholic wedding next summer in Texas. Long story. She is in the midst of defending her master's thesis this spring, and then starting her Phd the next day. Busy girl. Julie and I buy each other small things for Christmas, the only caveat being that we each receive the same number of gifts, yeah right, like third graders. This is a holdover from her childhood as the middle child of five. We each make a list, and we honestly try to keep the $$$ down. Socks, fancy face cream, lipsticks, perfume, scarves and sweaters and mittens, all those girly things. We used to exchange books, but not so much any more as we buy anything we want and put it on our Kindles as soon as the book comes out. Julie says she prefers print, but I haven't seen her buy one since I put her on my Amazon account years ago! For the first time in 20+ years, julie won’t be singing midnight mass. At midnight. Or Lessons and Carols. I expect we’ll find a place to go to both but at decent hours. For decades I’ve been up until two ayem on Christmas morning, wising is been in bed hours ago. Seven pm is midnight somewhere, right? As a child I loved midnight mass...the crisp darkness, the flickering candles and singing all the old carols. We used to go to Bath Abbey... So beautiful. Now I'm glad my choir sings at 9 pm! You're right - kids are easy. The Boy wants a sweater from Patagonia and snowboard gear. The Girl only has two items on her list this year: a cashmere sweater and AirPods (the wireless earbud headphones from Apple). My husband is not a fan of buying gifts for adults. He takes the money and donates it to charity. Who gets to pick the charity? I don't have to worry about the turkey day stuff, I've been invited to the same friend of the family's home this year as I was last year. I don't give gifts to my agent or editor. Yikes. Should I be? I've sent cupcakes over on book launch day. Yes, I give gifts to 2 agents, 2 editors, 2 publicists. Always hard to find the right thing. My agency gives a big donation to charity in our name. Oh if I had all the money in the world.... I would buy my CA daughter a new car. Her car was stolen 3 weeks ago and there was no theft insurance or funds for replacement. Moving on to reality on Nome street we celebrate birthday months so Christmas is sorta left in the dust. I give books to my grands and pretty much holiday wishes to everyone else. Wishing all of you happy shopping. How awful! Because you can't live in California without a ca. My gift giving list has gotten smaller this year. I bake for the office, the couples on my list always get a gift certificate for dinner for two to one of their favorite restaurants. For my travel buddies, I try to do something that includes mementos of our trips (calendar with pics, a coffee mug with a group shot of the three of us, a food basket with some sort of regional goodie). I shop for my son all year. As I see something that I hope he will enjoy, I pick it up and tuck it away. As for gits for me, I've asked that people give me "an experience" because I just don't have room for more "stuff". This has given me Catalina Island for my birthday, tea aboard the Queen Mary, a day at Santa Anita race track and this year, Christmas Lights at the LA Zoo. Experience gifts sound lovely, Lyda! 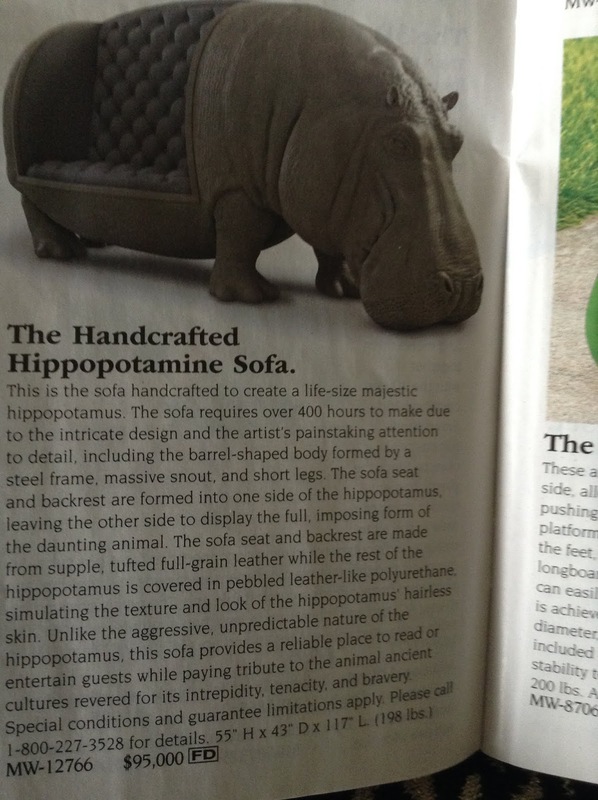 Rhys, the hippo sofa cracks me up. Everyone needs one of those in their living room! We used to get the Neiman-Marcus Christmas catalog but I don't think I've seen one in years. We do get Hammacher Schlemmer for some reason, which I try to toss in the recycle bin before Rick sees it and decides he must have a Dual Wheel Gyroscopic Scooter https://www.hammacher.com/product/dual-wheel-gyroscopic-scooter, or the Wearable Virtual Cinema... Actually, he told me he wants a leather flat cap. That, I can do. Mostly I am looking forward to buying a few things for the granddaughter--Christmas should really be fun this year. My daughter told her Grammy was bringing her presents from London and she said, "No! Santa's bringing them!!!" I love getting gifts--and giving them is the best. But as the guys have gotten older, I find what they appreciate the most are their Christmas stockings--I stuff them full of the sorts of things they use but never think to pick up for themselves--their favorite cologne, guitar picks, warm socks (yes, socks, as Dumbledore says...), etc. And the gift I most appreciate is time--when they give me time and we create another memory to savor. We used to love circling things in the Christmas catalogs...we had to use different colored ink so Mom would tell them apart. One year my sister and I both got matching stereos - they had record player, 8 track, and cassette players! We were really surprised since the folks usually never got us anything we circled. I love that they didn't make you share one. My favorite gift ever was when I managed to get tickets to Phantom of the opera when it was supposedly sold our. I sent each child an invitation in calligraphy on parchment inviting them to an evening of music and mayhem, signed your friend, the phantom. W hatching realization on their faces was priceless. Rhys, what a great gift!! In the early years of our marriage I never had any trouble buying gifts for husband Frank. Now he’s usually bought whatever he wanted already. Sometimes I make note of a book WSJ reviews that I think he’ll like. That has worked out well but I’m up the creek this year. No such book has appeared. Our son is a grownup and I’ve no idea what to get him. Ditto his 18 year old daughter. Ditto everyone this year. Aaargh. My husband has been out of sync with me forever when it comes to gift giving. The worst was the year he got me a deep fat fryer. He had been enjoying fresh fried fish while he was living on Padre Island while teaching at the Border Patrol Academy. I guess he thought he’d share the joy back home in El Paso. Nowadays he plays it safe by giving me a Barnes & Noble gift card. Sometimes he’ll write me a note promising me my choice of a trip. Smart man. Our family always exchanges wish lists, so it's fairly easy. My parents just sent the e-mail requesting then yesterday, so I've got to make sure mine is up to date and get it sent out today. For years and years when asked to provide family a Christmas last, I always put socks at the top of the list. Everyone seemed to think it was a joke, but I really wanted them! And then a few years ago Deb Crombie introduced JRW to SolMates. I now buy myself a pair for Christmas and a pair for my birthday. The owner of the gift shop where I get them has been known to stop me in the street to let me know that she has ordered new designs. Books. It's always (well, almost always) books. The grandkids get age appropriate children's books and/or coloring books, the older ones only want gift Visa cards, but we don't do that, so it's a small gift card to a store and a book, whether they like it or not. Turns out they usually do. For the daughters, they say what they want and we buy it if it's in the reasonable price range, which it always is. They know better than to ask for too much. My wife is impossible. It's another "I don't need anything" situation, and I never know what to do. For me, it's easy. I have a wish list on Amazon, and I put things on it (books) and some of them appear, wrapped, at Christmas. I just exchange gift cards with my sister-in-law and some friends. One of my friends always asks his wife to pick gifts for us, and she picks knickknacks that I really don't need. I have lots of souvenirs from my trips all over the house already. Giant Food gift cards are good for everyone. We all like to eat. Of course, Barnes and Noble, Staples, and Boscov's are good, too. As I get older, I seem to get pickier. I'm so fussy about pocketbooks that I didn't keep one that I picked out myself! My mother gave me a gift that has made giving gifts very, very easy. She taught me to listen always to what people said they wanted ALL year long and not to ask “what do you want for birthday/Christmas/whatever.” And to treasure the giver not the gift — I found the string of buttons in the glitter-encrusted bag (presented when I was 7 or 8) in her special jewelry box when I was 66. I hope that I have made givers of gifts to me special, important, and loved whatever I felt about the gift. It is really tough finding the perfect gift! I love the Icelandic tradition of giving books as Christmas gifts. My favorite Christmas gifts are books. And I give your Christmas books like 12 Clues of Christmas as Christmas gifts. One of my joys is opening the Advent Calendar day by day during the month of December. And I send Christmas cards. I always love receiving Christmas newsletters because I know interesting people!